During our upcoming trip to Memphis in March, Gerry and I will be staying at the Peabody Hotel in Memphis. We are very excited about the stay there because the hotel is gorgeous, decorated in a style of old elegance of Italian Renaissance Revival, and is the only historic hotel in the city. 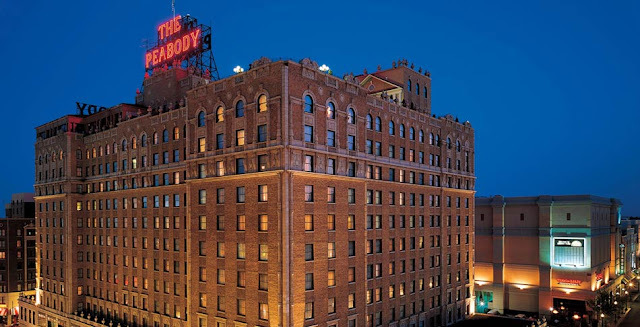 The hotel has been a mainstay of the city since the 1860’s, and is considered as one of the country’s most outstanding preservation case studies. Since the hotel is centrally located in downtown Memphis it is very close to many of the cities attractions, Museums, Theaters and even Graceland, so I will not be bored when Gerry is busy with work obligations. Although it is richly decorated, the hotel offers all the modern amenities that we expect in a contemporary hotel. The hotel itself offers a very unique attraction. The marble fountain in the main hotel lobby is graced with real, live mallard ducks that march into the fountain at 11 am and 5 pm daily. When not performing, they live in the Royal Duck Palace in the hotel’s rooftop. Needless to say duck is not served at the hotel restaurant. We are really looking forward to seeing this example of southern hospitality.